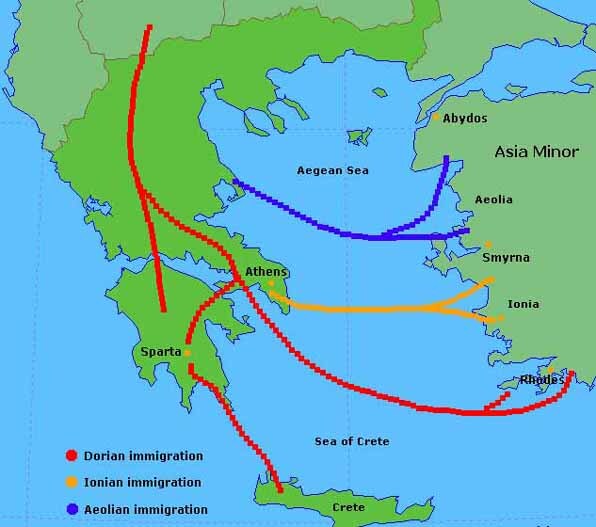 The Greeks are believed to have migrated southward into the Greek peninsula in several waves beginning in the late 3rd millennium BC, the last being the Dorian invasion. The period from 1600 BC to about 1100 BC is described in History of Mycenaean Greece known for the reign of King Agamemnon and the wars against Troy as narrated in the epics of Homer. The period from 1100 BC to the 8th century BC is a "dark age" from which no primary texts, and only scant archaeological evidence, survive. Secondary and tertiary texts such Herodotus "Histories", Pausanias "Description of Greece", Diodorus "Bibliothiki" and Jerome's "Chronicon", contain brief chronologies and king lists for this period. The history of Ancient Greece is taken to end with the reign of Alexander the Great, who died in 323 BC. Subsequent events are described in History of Hellenistic Greece. Any history of Ancient Greece requires a cautionary note on sources. Those Greek historians and political writers whose works have survived, notably Herodotus, Thucydides, Xenophon, Demosthenes, Plato and Aristotle, were mostly either Athenian or pro-Athenian, and all were political conservatives. That is why we know far more about the history and politics of Athens than of any other city, and why we know almost nothing about some cities' histories. These writers, furthermore, concentrate almost wholly on political, military and diplomatic history, and ignore economic and social history. All histories of Ancient Greece have to contend with these biases in their sources. In the 8th century BC Greece began to emerge from the Dark Ages which followed the fall of the Mycenaean civilization. Literacy had been lost and the Mycenaean script forgotten, but the Greeks adapted the Phoenician alphabet to Greek and from about 800 BC a written record begins to appear. Greece was divided into many small self-governing communities, a pattern dictated by Greek geography, where every island, valley and plain is cut off from its neighbors by the sea or mountain ranges. As Greece recovered economically, its population grew beyond the capacity of its limited arable land, and from about 750 BC the Greeks began 250 years of expansion, settling colonies in all directions. To the east, the Aegean coast of Asia Minor was colonied first, followed by Cyprus and the coasts of Thrace, the Sea of Marmara and south coast of the Black Sea. Eventually Greek colonisation reached as far north-east as Ukraine. To the west the coasts of Albania, Sicily and southern Italy were settled, followed by the south coast of France, Corsica, and even northeastern Spain. Greek colonies were also founded in Egypt and Libya. Modern Syracuse, Naples, Marseilles and Istanbul had their beginnings as the Greek colonies Syracusa, Neapolis, Massilia and Byzantium. By the 6th century BC Hellas had become a cultural and linguistic area much larger than the geographical area of Greece. Greek colonies were not politically controlled by their founding cities, although they often retained religious and commercial links with them. The Greeks both at home and abroad organised themselves into independent communities, and the city (polis) became the basic unit of Greek government. As colonization was bound to exhaust the supply of desirable territory, first Crete, then in short order the other Greek city-states, adopted the formal practice of pederasty, in an effort to find a permanent solution to the problem of overpopulation. From its ritual roots in Indo-European prehistory, the practice was elevated to prominence, influencing pedagogy, warfare and social life, and becoming a central feature of Hellenic culture for the next thousand years. The Greek cities were originally monarchies, although many of them were very small and the term "King" for their rulers is misleadingly grand. In a country always short of farmland, power rested with a small class of landowners, who formed a warrior aristocracy fighting frequent petty inter-city wars over land. But the rise of a mercantile class (shown by the introduction of coinage in about 680 BC) introduced class conflict into the larger cities. From 650 BC onwards, the aristocracies were overthrown and replaced by populist leaders called tyrants (tyrranoi), a word which did not necessarily have the modern meaning of oppressive dictators. By the 6th century several cities had emerged as dominant in Greek affairs: Athens, Sparta, Corinth, and Thebes. Each of them had brought the surrounding rural areas and smaller towns under their control, and Athens and Corinth had became major maritime and mercantile powers as well. Athens and Sparta developed a rivalry that dominated Greek politics for generations.In Sparta, the landed artistocracy retained their power, and the constitution of Lycurgus (about 650 BC) entrenched their power and gave Sparta a permanent militarist regime under a dual monarchy. Sparta dominated the other cities of the Peloponnese, and formed alliances with Corinth and Thebes. In Athens, by contrast, the monarchy was abolished in 683 BC, and reforms of Solon established a semi-constitutional system of aristocratic government. The aristocrats were followed by the tyranny of Pisistratus and his sons, who made the city a great naval and commercial power. When the Pisistratids were overthrown, Cleisthenes established the world's first "democracy" (500 BC), with power being held by an assembly of all the male citizens. In Ionia (the modern Aegean coast of Turkey) the Greek cities, which included great centres such as Miletus and Halicarnassus, were unable to maintain their independence and came under the rule of the Persian Empire in the mid 6th century. In 499 BC the Greeks rose in the Ionian Revolt, and Athens and some other Greek cities went to their aid. Ten years later Darius's successor, Xerxes I, sent a much more powerful force by land. After being delayed by the Spartan King Leonidas I at Thermopylae, Xerxes advanced into Attica, where he captured and burned Athens. But the Athenians had evacuated the city by sea, and under Themistocles they defeated the Persian fleet at the Battle of Salamis. A year later the Greeks under the Spartan Pausanius defeated the Persian army at Plataea. The Persian Wars ushered in a century of Athenian dominance of Greek affairs. Athens was the unchallenged master of the sea, and also the leading commercial power, although Corinth remained a serious rival. The leading statesman of this period was Pericles, who used the tribute paid by the members of the Delian League to build the Parthenon and other great monuments of classical Athens. By the mid 5th century the League had become an Athenian Empire, symbolized by the transfer of the League's treasury from Delos to the Parthenon in 454 BC. The wealth of Athens attracted talented people from all over Greece, and also created a wealthy leisured class who became patrons of the arts. The Athenian state also sponsored learning and the arts, particularly architecture. Athens became the centre of Greek literature, philosophy (see Greek philosophy) and the arts. Some of the greatest names of Western cultural and intellectual history lived in Athens during this period: the dramatists Aeschylus, Aristophanes, Euripides, and Sophocles, the philosophers Aristotle, Plato, and Socrates, the historians Herodotus, Thucydides, and Xenophon, the poet Simonides and the sculptor Pheidias. The city became, in Pericles's words, "the school of Hellas. "The other Greek states at first accepted Athenian leadership in the continuing war against the Persians, but after the fall of the conservative politician Cimon in 461 BC, Athens became an increasingly open imperialist power. After the Greek victory at the Battle of the Eurymedon in 466 BC, the Persians were no longer a threat, and some states, such as Naxos, tried to secede from the League, but were forced to submit. The new Athenian leaders, Pericles and Ephialtes, let relations between Athens and Sparta deteriorate, and in 458 BC war broke out. After some years of inconclusive war a 30-year peace was signed between the Delian League and the Peloponnesian League. This coincided with the last battle between the Greeks and the Persians, a sea battle off Salamis in Cyprus, followed by the Peace of Callias (450 BC) between the Greeks and Persians. 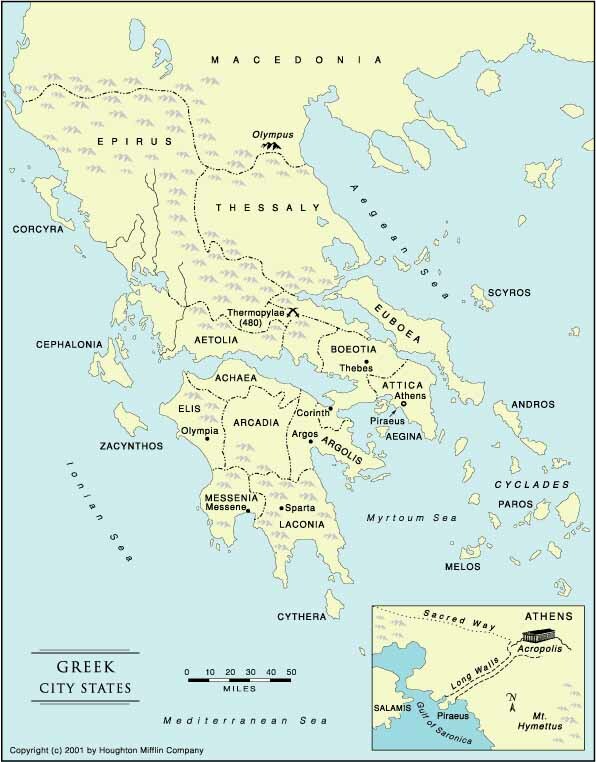 In 431 BC war broke out again between Athens and Sparta and its allies. The immediate cause was a dispute between Corinth and one of its colonies, Corcyra, in which Athens intervened. The real cause was the growing resentment of Sparta and its allies at the dominance of Athens over Greek affairs. The war lasted 27 years, partly because Athens (a naval power) and Sparta (a land-based military power) found it difficult to come to grips with each other. In 418 BC, however, hostility between Sparta and the Athenian ally Argos led to a resumption of fighting. At Mantinea Sparta defeated the combined armies of Athens and her allies. The resumption of fighting brought the war party, led by Alcibiades, back to power in Athens. In 415 BC Alcibiades persuaded the Athenian Assembly to launch a major expedition against Syracuse, a Peloponnesian ally in Sicily. Though Nicias was a skeptic about the Sicilian Expedition he was appointed along Alcibiades to lead the expedition. Due to a accusations against him Alcibiades fled to Sparta where he persuaded Sparta to send aid to Syracuse. As a result the expedition was a complete disaster and the whole expeditionary force was lost. Nicias was executed.Sparta had now built a fleet to challenge Athenian naval supremacy, and had found a brilliant military leader in Lysander, who seized the strategic initiative by occupying the Hellespont, the source of Athens' grain imports. Threatened with starvation, Athens sent its last remaining fleet to confront Lysander, who decisively defeated them at Aegospotami (405 BC). The loss of her fleet threatened Athens with bankruptcy. In 404 BC Athens sued for peace, and Sparta dictated a predictably stern settlement: Athens lost her city walls, her fleet, and all of her overseas possessions. The anti-democratic party took power in Athens with Spartan support. The end of the Peloponnesian War left Sparta the master of Greece, but the narrow outlook of the Spartan warrior elite did not suit them to this role. Within a few years the democratic party regained power in Athens and other cities. In 395 BC the Spartan rulers removed Lysander from office, and Sparta lost her naval supremacy. In 387 BC Sparta shocked Greek opinion by concluding a treaty with Persia by which they surrendered the Greek cities of Ionia and Cyprus, thus reversing a hundred years of Greek victories against Persia. Sparta then tried to weaken the power of her former ally Thebes, which led to a war in which Thebes allied herself with the old enemy, Athens. The Theban generals Epaminondas and Pelopidas won a decisive victory at the at Leuctra (371 BC). The result of this battle was the end of Spartan supremacy and the establishment of Theban dominance, but Athens also recovered much of her former power. The supremacy of Thebes was short-lived. With the death of Epaminondas at Mantinea (362 BC) the city lost its greatest leader, and his successors blundered into an unsuccessful ten-year war with Phocis. In 346 BC the Thebans appealed to Philip II of Macedon to help them against the Phocians, thus drawing Macedon into Greek affairs for the first time. The Kingdom of Macedon was formed in the 7th century. Some Greeks regarded the Macedonians as barbarians, but whatever their original ethnic origins, they were of Greek language and culture by the 5th century. They played little part in Greek politics before the beginning of the 4th century, but Philip was an ambitious man who had been educated in Thebes and wanted to play a larger role. In particular, he wanted to be accepted as the new leader of Greece in recovering the freedom of the Greek cities of Asia from Persian rule. By seizing the Greek cities of Amphipolis, Methone and Potidaea, he gained control of the gold and silver mines of Macedonia. This gave him the resources to realise his ambitions. Philip established Macedonian dominance over Thessaly (352 BC) and Thrace, and by 348 BC he controlled everything north of Thermopylae. He used his great wealth to bribe Greek politicians and create a "Macedonian party" in every Greek city. His intervention in the war between Thebes and Phocis brought him recognition as a Greek leader, and gave him his opportunity to become a power in Greek affairs. But despite his sincere admiration for Athens, the Athenian leader Demosthenes, in a series of famous speeches (philippics) roused the Greek cities to resist his advance. In 339 BC Thebes, Athens, Sparta and other Greek states formed an alliance to resist Philip and expel him from the Greek cities he had occupied in the north. But Philip struck first, advancing into Greece and defeating the Greek cities at Chaeronea in 338 BC. This traditionally marks the end of the era of the Greek city-state as an independent political unit, although in fact Athens and other cities survived as independent states until Roman times. Philip tried to win over Athens by flattery and gifts, but did not really succeed. He organized the cities into the League of Corinth, and announced that he would lead an invasion of Persia to liberate the Greek cities and avenge the Persian invasions of the previous century. But before he could do so he was assassinated (336 BC). Philip was succeeded by his 20-year-old son Alexander, who immediately set out to carry out his father's plans. He travelled to Corinth where the assembled Greek cities recognized him as leader of the Greeks, then set off north to assemble his forces. The army with which he invaded the Persian Empire was basically Macedonian, but many idealists from the Greek cities also enlisted. But while Alexander was campaigning in Thrace, he heard that the Greek cities had rebelled. He swept south again, and captured Thebes, razed the city to the ground as a warning to the Greek cities that his power could no longer be resisted. In 334 BC Alexander crossed into Asia, and defeated the Persians at the river Granicus. This gave him control of the Ionian coast, and he made a triumphal procession through the liberated Greek cities. After settling affairs in Anatolia, he advanced south through Cilicia into Syria, where he defeated Darius III at Issus (333 BC). He then advanced through Phoenicia to Egypt, which he captured with little resistance, the Egyptians welcoming him as a liberator from Persian oppression. Darius was now ready to make peace and Alexander could have returned home in triumph, but he was determined to conquer Persia and make himself the ruler of the world. He advanced north-east through Syria and Mesopotamia, and defeated Darius again at Gaugamela (331 BC). Darius fled and was killed by his own followers, and Alexander found himself the master of the Persian Empire, occupying Susa and Persepolis without resistance. Alexander's empire broke up soon after his death, but his conquests permanently changed the Greek world. Thousands of Greeks travelled with him or after him to settle in the new Greek cities he had founded as he advanced, the most important being Alexandria in Egypt. Greek-speaking kingdoms in Egypt, Syria, Iran and Bactria were established. The Hellenistic age had begun.